It’s official. Robo-Advisors are now a thing! Do you want to be an experimental lab-rat? It’s possible that’s where you’re headed if you choose a Robo-Advisor. Your hard-earned money is being tempted to join in a grand experiment. It works like this: Wall Street would prefer to actually never have to WORK to make money. If an automated SYSTEM can take the place of PEOPLE, then hey, “we’ve got a new cash cow,” says management. 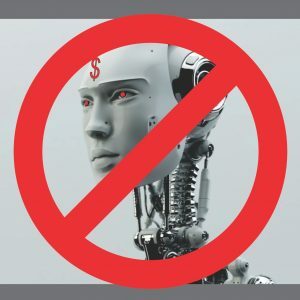 Specifications are fed into a big computer and out pops… the Robo-Advisor. It’s a perfect storm. Fascination with technology and progress join the Marketing Department and Presto! Wall Street can point its finger at a machine if things go wrong – and they surely will. Meanwhile, the public is fascinated by technology – early adopters of Robo-Advisors were tech-startup employees, targeted by promises of a magic future. The originators of Robo-Advisors were professors. You know — the kind of people who are always right. Except for one thing. They never actually managed money. And what about RESPONSIBILITY? One Robo-Advisor agreement we read actually states that the client agrees to hold the Robo-Advisor and its people HARMLESS against…. losses. You read that right. Sign here, Mr. & Mrs. Client. You now have no recourse if and when the machine breaks down. And it already has. Modern Portfolio Theory won a Nobel Prize in 1990. The great and powerful wizard behind the curtain studied the effects of asset risk, return, correlation, and diversification. A system was developed that essentially said, “since various classes of assets do not correlate, combine different-class investments in a diversified portfolio; that can reduce volatility.” It made such perfect sense. Except: It only works in stable economic environments. And those, dear reader, are a thing of the past. In the volatility of the 2007 crash, something happened that the wizard did not factor into his perfect system. ALL CLASSES OF INVESTMENT correlated. EVERYTHING went down. It was a Black Swan Event. From that day forward, those who didn’t drink the Kool-Aid, who found Modern Portfolio Theory lacking in nuance and refinement were soundly vindicated. The wizard behind the machine turned out to be a wishful thinker. The sad part is that with the Robo-Advisor, there’s not much you can do when the machine breaks down and your money is the victim. Big money companies are investing in their own brands of Robo-Advisors faster than grocers are going organic. The stakes are high. Investment industry researcher Cerulli Associates estimates that assets under management of Robo-Advisors could soar by 2,500 percent to $489 billion in 2020 from $18.7 billion in 2015. The investment firms love cookie cutter solutions. They want to brainwash the public into thinking cookie-cutters are the answer. “Oh these are not your grandmother’s old-fashioned manual cookie cutters. These are robotic cookie cutters.” They especially love such solutions that involve very little actual manpower, overhead, and client interaction. The formula is simple: Take a quick risk tolerance test, sign the paperwork, hand over your money, and boom! You never have to pay attention ever again. That’s a dangerous, risky recipe. Why? Because investment should ALWAYS be personal, custom, refined, reviewed, and engaged. The intrinsic flaw of colonialism came from trying to systematize resource extraction and subjugation of native populations. Think about it. Trade of spice, sugar, precious metals, coffee… blood diamonds… slavery, to name a few. These examples are not the gleaming examples of enlightened humanity’s enterprise. The Robo-Advisor premise never mentions the need to use your capitol to create a better world. It’s the opposite. Like colonialism, the premise is based on greed alone. How much can you get with how little effort, and how low a cost? That’s a stupid, amoral proposition that smacks of profound deception and manipulation. It’s based on a world-view that history has proven — over and over — to be defective. The humanity of investment can be stunningly beautiful. A human can draw on a hundred billion neurons, millions of years of evolution, and ancestral DNA to avoid risk, embrace love, and foster legacy. Who told you “people are nothing?” Only despots, faceless corporations, and outlaws who want to milk you for everything you’re worth. Blood, sweat, and tears; these are the foundation of making life better. Not every investment professional is reliable, granted. And those who are lazy, which may be the majority, might be worse than a robot. But if you find one human investor who is noble and diligent, you’ll do more than profit. You’ll actually make sense and so will your money. Beauty and confidence are the results. That beauty appears only when we have a face, when we are dealing with people, working together to make a better world. Confidence comes from slowly mastering something we once might have avoided. Our technology cannot take the place of a face. It fails when we turn a blind eye to the underlying actions and motives of the companies we own. It rises when we are engaged, attentive, confident, and dedicated. That is something no machine will ever offer.